The ED252 range of switches have been designed to provide a rapid means of disconnecting batteries or other power supplies in the event of serious electrical faults. 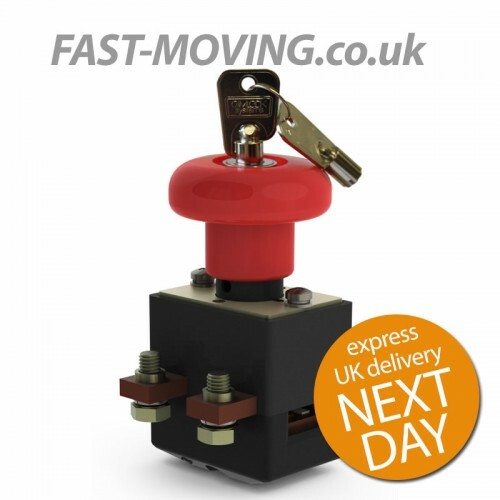 Whilst the switches are primarily intended for use with battery powered vehicles they are also suitable for use with static power systems. All types are capable of safely rupturing full load battery currents in the event of an emergency. The ED252 is a manually operated device with an over-centre spring mechanism which provides a snap action for both opening and closing of the main contacts. The ED252 is easy to install (see drilling details) and is secured with supplied M5 posidrive mounting screws. Lockable versions feature a key which is necessary for the knob to be moved from the “Off” position to the “On” position. Once in the “On” position, the key can be removed. Thereafter, the knob may be depressed to the “Off” position where it will automatically lock and remain locked until the key is used again to unlock it. The ED252 is fully serviceable with genuine replacement parts available. When fitted with magnetic blowouts the polarity marked on the contact housing must be observed when connecting the main terminals. Ensure that the switches are installed in a position where heavy arcs emanating from the switch cannot damage or electrically jump across to adjacent parts. The switch is to be used to rupture current in an emergency or as a no-load isolator.